By Jennifer Burcke on January 22, 2011 Visit Jennifer's Website. “Now is the winter of our discontent.” So begins Richard III by William Shakespeare. No, I won’t turn this into a post about iambic pentameter. However, I will tell you that here at 1840 Farm, the year 2011 began in much the same way as Shakespeare’s epic masterpiece. We are deep in the discontent here. Knee deep. It’s a good thing we’ve got wellies. So, why the restlessness? Simple. I’ve done the unthinkable. I have willingly added an outdoor chore to be completed every day, no matter the weather. I am a New Englander. You would think that I would know better. Winter is long here. Painfully so most years. And yet, I need to tend the chickens no matter the weather or depth of the freshly fallen snow. The depth of said snow keeps growing exponentially every day. And yes, in case you are keeping score at home, we have yet to see even one egg. What was I thinking? Back to the chickens and snow. 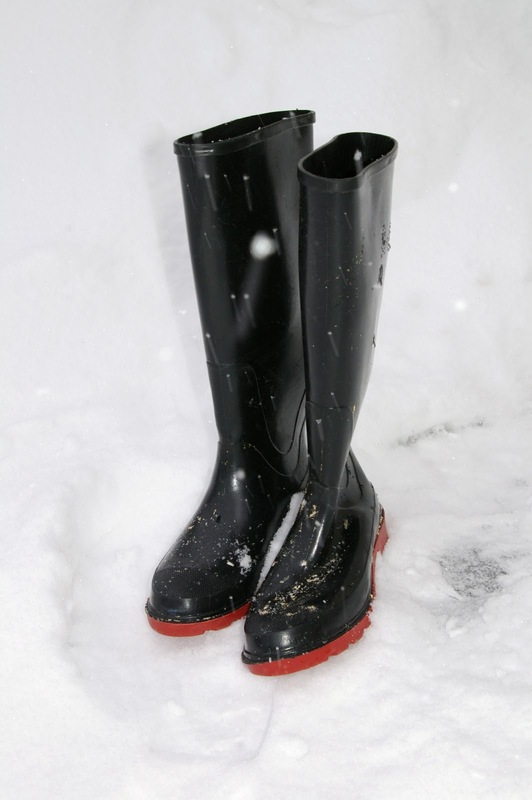 Every day I arm myself with snow shovel, fresh fruits and vegetables, and my Wellington boots and embark on my daily routine. After clearing a path through the fresh snow, I open the door and find our seven feathered friends warm and cozy in their coop. They happily greet me with their cacophony of chicken vocalizations.I can see that they are eager to find out what kind of fresh treats I have brought them. I can also see that they are blissfully unaware of the frustratingly snowy situation right outside their coop door. 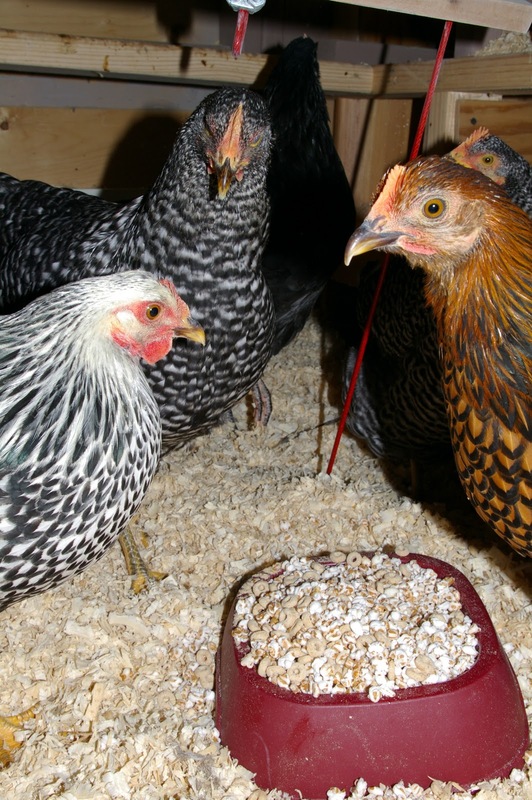 The treat-filled bowls get settled into the thick pine shavings and the hens happily gather around to inspect the contents. The chickens begin to pick over their salad bar and predictably choose anything red first. 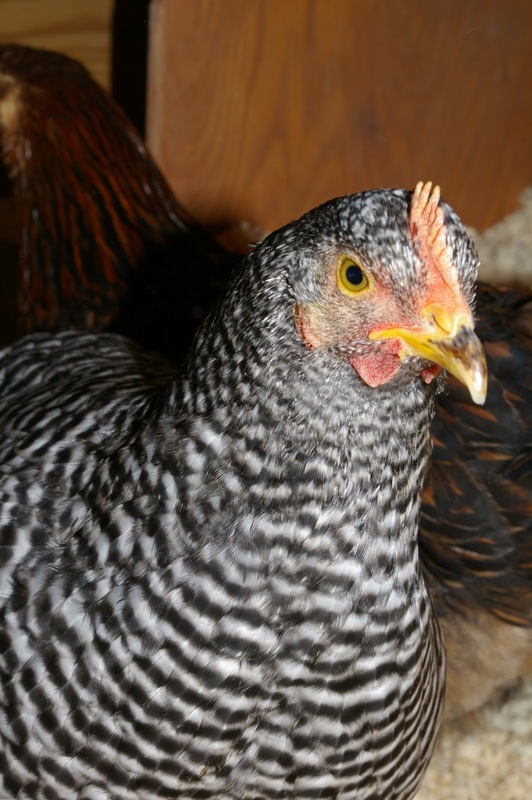 Then, just like clockwork, Sally the Silver Laced Wyandotte begins her daily performance. She walks through the middle of one bowl and then stops to turn around and ensure that she has the other six hens’ attention. 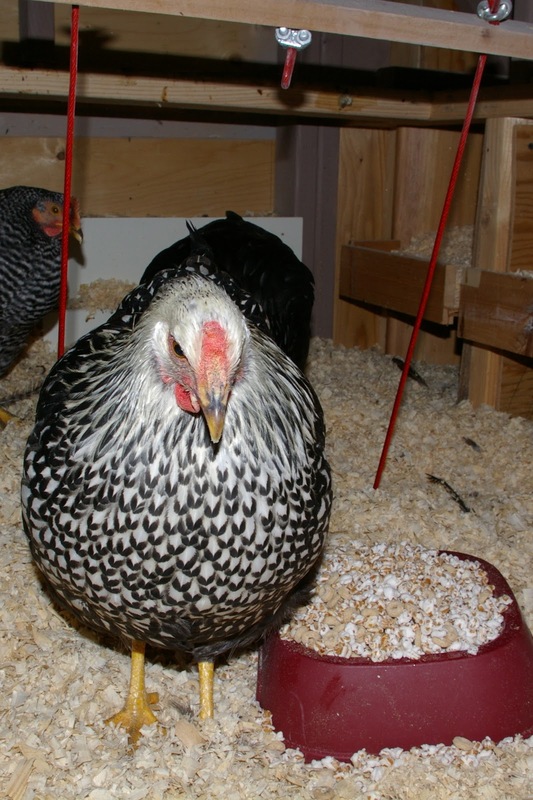 As soon as she is pleased with her audience, she promptly turns the entire contents of the bowl over onto the coop floor. She gets great joy out of this relatively simple act. She exits the bowl and fluffs her breast feathers as if she is an acclaimed actress preparing to take her bow on opening night. The rest of the flock just move on to the other bowl. They are not impressed. As I change the water, the two Golden Laced Wyandottes wander over to the door and take a peek outside. This is their daily routine. They never gather the courage to reach the threshold, but they are very curious about what is going on outside. The other hens don’t seem interested. They are too busy having their snack to care about anything else. I wish the hens a good day and can usually count on one or two of them to come gather at my feet for a scratch on the back. Then they’re off to snack and roost and pass the day watching the mysterious white flakes of snow fall outside their window. It’s their own version of reality television. There’s no script for what might be happening outside that window, but there’s always something to watch. Mission accomplished, I make my snowy retreat to the farmhouse. The wellies can be put away until tomorrow. I have completed my daily chicken routine just as our chickens have completed theirs. From their perspective, the day is as it should be. They have food, water and shelter from the storm. Maybe it really is that simple. In fact, maybe I need to take a cue from our hens and ignore the never-ending snow. As the snow fell last night, I fell into a deep and peaceful sleep, much like the chickens out in our coop. I woke up this morning, put on my wellies , grabbed the shovel, water, and treats and headed out to do my morning chicken chores. More than six inches of new snow lay on the ground and it was still falling fast. I could feel the discontent creeping back in. 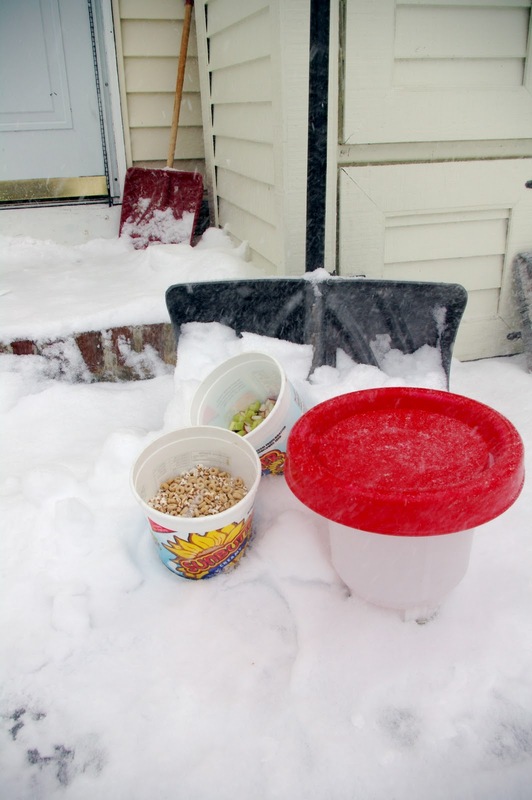 I grumbled at the snow as I balanced the treats and waterer and fumbled with the lock on the coop door. The door swung open and I had a pair of two eyes staring at me. It was Marigold the Barred Plymouth Rock. She didn’t care that it had snowed all night. She didn’t care that I was tired of waking up to several inches of new snow each morning and shoveling my way to the coop. She only cared that I had apples and celery and fresh water. I guess it really is that simple. Once we had run through our morning routine, I trudged back to the house. I turned and looked at our coop. I had to admit that it looked beautiful in the freshly falling snow. Maybe I would have to take a cue not only from our chickens but from Shakespeare’s Richard III himself. I would have to find a reason to revel in my discontent. I would have to remind myself that while not perfect, my winter chicken-keeping reality wasn’t so bleak. Yes, it was winter, but we were keeping chickens. We had worked hard during the last year so that chickens could live on our farm. A snowy winter was just part of our new routine. 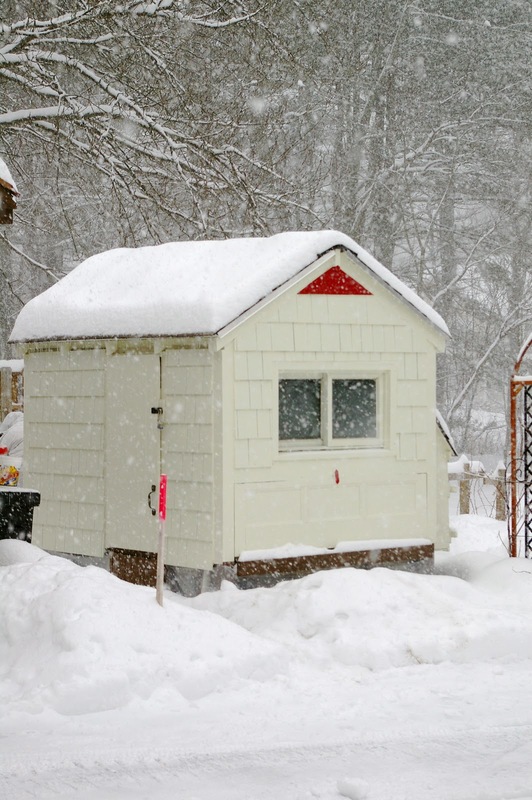 I know that winter will keep me away from my beloved garden and chicken coop for several months while the snow flies outside. Perhaps I should spend my time confined indoors this winter reading Mother Earth News and Grit magazines, researching an appropriate breed of heritage rooster to add to our flock. Then the really big decision would have to be made. Should he be named Richard III or William Shakespeare? Awe this post was so sweet..I don’t have chickens yet, but I want to have them. I live in a place with a long winter and a short summer too, so this could be me next year. I love your chicken coop too. I am in Northern Ontario. Do you open the door in the winter to let your chickens outside? I can totally relate! No matter how depressed or down I get, I can just sit down in the middle of the coop floor. Within seconds I am completely covered with cackling birds. It never fails to brighten the day!